Each #10 can contains 3.5 pounds of Instant Chocolate Pudding. That's 56 servings of Chocolate Pudding! The simple mention of chocolate pudding evokes childhood memories of the decadent chocolate treat that mom used to make or the plastic pack stuffed into a lunch box geared at prompting an after lunch smile. Instant chocolate pudding is a staple of moms everywhere . 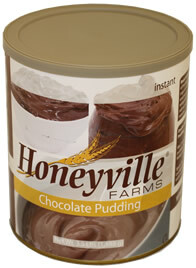 Honeyville's Instant Chocolate Pudding is a jumbo-sized adaptation of the small, store-bought, boxes of pudding. Each large #10 can contains 56 servings of Chocolate Pudding. That's about 14 average size boxes of store bought pudding. It's a great value that will go a long way. Try some today! Basic Instructions: Add 1 cup of Chocolate Pudding mix into bowl. Add 3 cups of cold milk. Mix with whisk until mix starts to thicken. Place in refrigerator. Pudding will be soft-set and ready to eat within 5 minutes. Double Trouble Chocolate Pudding: Mix 2 cups cold milk and 3/4 cup Chocolate Pudding mix in bowl with whisk. Refrigerate for 5 minutes. Spoon into serving dishes. Add 4 crumbled chocolate cream sandwich cookies as a topping. Chocolate Pudding Pie: Prepare pudding as directed, reducing milk to 2 1/2 cups. Pour, at once, into Graham Cracker Pie Crust. Refrigerate at least 1 hour, or until set. Top with whipped cream. Enjoy! Ingredients: Sugar, Modified Food Starch, Cocoa (processed with alkali), Salt, Disodium Phosphate, Mono and Diglycerides, Tetrasodium Pyrophosphate, Natural and Artificial Flavors, FD&C Red 40 Lake, FD&C Yellow 5 Lake, FD&C Yellow 6 Lake, FD&C Blue 1 Lake.